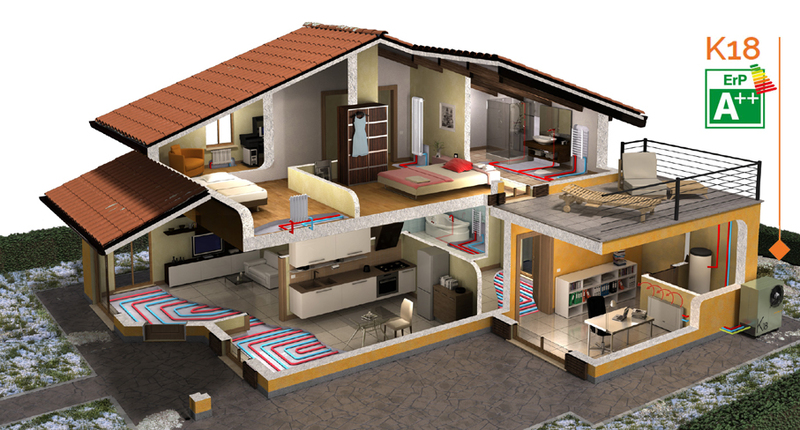 Many UK homes could benefit from a super-efficient Heat Pump boiler. The Robur K18 heat pump runs on Natural gas or LPG and offers exceptionally low running costs, at least 38% below the cost of a modern condensing boiler, with the equivalent savings in carbon emissions. Hot water is produced for heating or domestic hot water up to 70°C, just from the heat pump. Using inexpensive gas can provide an annual saving which exceeds capped FIT payments. The system uses green refrigerant, Ammonia, in a sealed circuit and can be installed outside by any gas safe heating engineer. With gas burners replacing compressors, the Robur K18 is considerably quieter than equivalent electric heat pumps. Supplied by Robur importer ESS, the K18 has an 18kW output and is ideal for larger or older properties with a high heating demand. The capital cost is substantially below that of a ground source heat pump and the running costs are lower and the performance is better than an equivalent electric heat pump. The K18 complements the commercial range from 40kW to 200kW offering heating and cooling models. ESS was established in 2000 as an HVAC distributor. Since 2003, ESS has become the UK’s leading supplier of Gas Powered Heat Pumps, and now offers Robur’s gas absorption heat pumps (GAHPs) in addition to its existing range of gas engine models. ESS is an independent, privately owned company, established for distribution of HVAC equipment to the trade only. It specialises in helping energy managers, M&E consultants, designers and other heating, ventilation and air-conditioning professionals.